Thrash metal outfit from Quebec City, Canada. 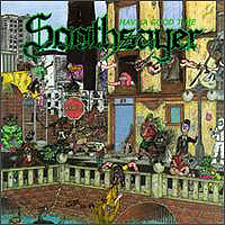 In october '86, Soothsayer went into the studio to record their first demo entitled "To Be A Real Terrorist". The result consists of five songs of pure thrash metal, intensity at its roughest! Back then, the climax of their young career was, undoubtedly, the release of their album "Have A Good Time". This LP, recorded in early 1989 but released in late 1990, has been made available to the public by the Californian independent label New Renaissance Records through their Colossal division and distributed by Restless Records. That album created a certain infatuation among the US radio colleges circuit. In addition, highly respected European publications, such as Kerrang and Metal Forces, qualified Soothsayer as a band to seriously keep an eye on! The band split-up in 1990.